Sergey Kasparov became a student in the Palace of Pioneers in the city of Baku at the age of seven, he acquired the grandmaster title in 2007, and has captured first place in many international tournaments. He has written several chess books and is a leading online chess coach. 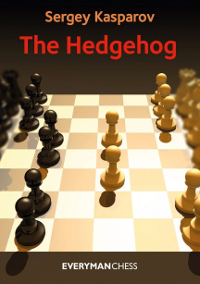 The Hedgehog is also available from Everyman Chess in CBV and PGN format for $19.95. “An understanding of Hedgehog structures is an essential component in any chessplayer’s knowledge. These structures arise when the black c-pawn is exchanged early on for the white d-pawn (as in the Sicilian Defence). White then adopts a formation with pawns on c4 and e4 and Black curls up in a Hedgehog formation with pawns on a6, b6, d6 and e6. There is also a conclusion, an index of variations, and an index of complete games. There is one comment to make about the production of the book, which is that the top border is missing from many of the diagrams. The Hedgehog can be considered as an update to Sergey Shipov’s The Complete Hedgehog from 2009. Kasparov writes that his goal is to share his own experiences in the Hedgehog “and supplement them with some topical and instructive games of strong players which have been played since Shipov’s book appeared.” He notes that “in many cases modern practice proves that Shipov’s assessments were correct,” but wants to provide fresh, original examples of the more common lines seen in play. Of the 107 complete games in the book, fifty-five are from Kasparov’s own practice, and three are from his wife. Kasparov has ten games as white and forty-five as black. He scored +7 =2 -1 as White; and +11 =26 -8 as Black; his wife has two losses and one draw as black. The plan of a kingside advance is interesting and promising. The idea is very controversial, but such aggression fits in well if one wants to play for a win as Black. In the Hedgehog Black is used to playing second fiddle, manoeuvring and awaiting the opponent’s mistakes. However, in this case there is quite a concrete pawn approach and, as is known, pawns can’t go backwards. Your author has been on both sides of this variation, so knows all about its many complexities. We’ll begin with a very meaty fight, where White didn’t try to stop the advance of the g-pawn, but carried out an advance of his own on the queenside. 14…Rfe8 is a curious option, which hopes for 15 b4 when the pawn can become vulnerable after 15…d5!?. After 16 cxd5 Bxb4 or 16 Bf4 e5 17 Nxd5 Bxd5 18 cxd5 Qb7 the situation is very unclear. This move is clear proof of Black’s aggressive intentions. He won’t tread water while White expands on the queenside. The race begins. The computer definitely sides with White, but I should state that over the board it is never easy when your opponent calmly rolls their pawns towards your king. This looks logical, since any delay would be bad. Indeed, White should hurry to open the a- and b-files and so distract Black from the kingside. However, Stockfish is unimpressed by such natural exchanges and now the position is for sure most unclear. White’s last few moves were rather poor, hence he already faces difficulties. Black has a extra pawn and White’s only stronghold in the centre on e4 is about to fall. However, 24 Rxb5 is also sub-optimal, in view of 24…Qa8. Playing by general motifs, I was too lazy to calculate the concrete variation 24…Bxe4 25 b6 (weaker is 25 Nxe4 Nxe4 26 Qd4+ Nef6 when Black has two extra pawns, although it’s not yet absolutely all over) 25…Bxb1 26 bxc7 Qxc7 27 Nxb1. This position is hard to assess fully, but Black’s material advantage is huge: a rook and three pawns against two bishops. The situation is quite tense. On occasion the black queen may be ‘mated’ down the a-file. The immediate 27…Nxe4!? looks more to the point. 28 Rb5 Nxe4 29 Nxe4 Bxe4 30 b7! Finally the German Grandmaster finds the way to trap the most powerful piece of the opponent. 33…Bxg2+! is more accurate and only after 34 Bxg2 then 34…e5. Both bishops are en prise here and the position is about equal. 36…d5 is also interesting, after which 37 f4 Nc6 38 Qf6 Bxf4 39 Rh3 Be5 40 Rxh7+ Kxh7 41 Bd3+ Rg6 42 Qxc6 looks like a draw. Spotting the threat of …Bd4. Time-trouble. Arkadij could have kept up the pressure by playing 39 Rg4 Ne5 40 Rxg7 Rxg7 41 h3. Alternatively, 40 Bxh7 Nd7 41 Qa1 Kxh7 42 Rh4+ Kg6 43 Rg4+ Kh7 44 Rh4+ with a draw. Implying threats along the first rank. The only way, but also a sufficient defence against the very strong bishop on d4. Kasparov offers objective assessments of the most important thematic ideas throughout the book. Because of its focus on plans and long-range maneuvering, the hedgehog is more of a high-level opening than most. This book is for more advanced players, rather than for beginners. The abundant amount of diagrams will allow strong players to read the book without using a chessboard. However, I recommend buying the ebook of The Hedgehog, because it can be used as a foundation for a repertoire database that you can build based on your own experiences and analysis.